glassblowing started from here its triumphal march all over the world. patinated and topped with stylish iron caps in the proper traditional style. 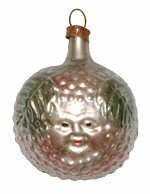 We have seen faces on fruit before, and not quite sure why, but fruit were an obvious first choice of subject for ornaments. Precious and valued, they obviously grew on trees but not to the abundance that many would have desired in previous times... This traditional design is a perfect vintage, classic addition to your tee. Produced from a vintage mould that has been carefully restored and is a work of art. 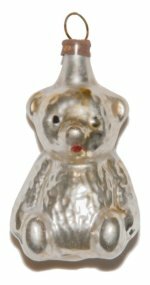 Made in the Green Heart of Germany, the Thuringian Forest by Nostalgie-Christbaumschmuck UG 2 inches - 5,0 cm Coming Soon - Check back in September! This traditional design is a perfect vintage, classic addition to your tee. Produced from a vintage mould that has been carefully restored and is a work of art. Made in the Green Heart of Germany, the Thuringian Forest by Nostalgie-Christbaumschmuck UG 2-3/16 inches - 5,5 cm Coming Soon - Check back in September! This traditional design is a perfect vintage, classic addition to your tee. Produced from a vintage mould that has been carefully restored and is a work of art. Made in the Green Heart of Germany, the Thuringian Forest by Nostalgie-Christbaumschmuck UG 2-3/8 inches - 6,0 cm Coming Soon - Check back in September! This traditional design is a perfect vintage, classic addition to your tee. Produced from a vintage mould that has been carefully restored and is a work of art. Made in the Green Heart of Germany, the Thuringian Forest by Nostalgie-Christbaumschmuck UG 2-3/4 inches - 7,0 cm Coming Soon - Check back in September! This traditional design is a perfect vintage, classic addition to your tee. Produced from a vintage mould that has been carefully restored and is a work of art. Made in the Green Heart of Germany, the Thuringian Forest by Nostalgie-Christbaumschmuck UG 3-3/8 inches - 8,5 cm Coming Soon - Check back in September!